Same mainstream media now covering marches against Trump refused to cover the March Against Monsanto... what does that tell you? (NaturalNews) Have you heard of the March Against Monsanto? If you only get your news from establishment media outlets, you haven't. Only the so-called 'alternative media' dares report such important events. And honestly, that should tell you all you need to know about the mainstream media, and why Americans' distrust of the media is at an all-time high. The MSM will cover wall-to-wall Trump "protest" events that are being staged and paid for by George Soros as real and spontaneous, but refuse to cover a genuine movement based on legitimate concerns about health and food. The next March Against Monsanto is scheduled to take place on May 20, 2017, where pro-clean food activists and others concerned about the damage non-organic, GMO foods are doing to the food chain and the environment will once again draw attention to the cause. -- Research has shown that Monsanto's genetically modified foods can lead to the formation of cancerous tumors and other serious health conditions and birth defects. -- In the U.S., the Food and Drug Administration, which is tasked with ensuring that food is safe for consumption, is guided by former Monsanto executives, which is a clear conflict of interest. There is no chance that any serious consideration by the FDA would be given to any proposals that would negatively affect the bio-technology giant. This could also help explain why so little government-led research into the long-term effects of GMOs on the food chain and environment has been conducted. -- So pervasive is Monsanto's reach (and money) that Congress and President Obama recently passed legislation nicknamed "The Monsanto Protection Act" which, among other things, bans courts from halting the sale of Monsanto's GMO seeds. As Mike Adams, the Health Ranger, has noted, the law "mandates the Secretary of Agriculture to issue permits and deregulation orders that allow the 'continued cultivation, commercialization and other specifically enumerated activities' even if a crop is deemed to be causing a plague or unleashing dangerous genetic pollution." It is apparent that, for far too long, Monsanto has been on the receiving end of corporate subsidies and political favoritism. Meanwhile, small farmers and organic growers have suffered losses as the bio-tech behemoth continues to spread its influence over the world's food supply, nearly monopolizing it. This includes being granted exclusive patent rights over seeds and their genetic makeup. -- Monsanto's GMO seeds and chemical pesticides are harmful to the environment and to human beings. Some scientists have even said pesticides and herbicides from the Big Three (Monsanto, Syngenta and Bayer) killed nearly half of all U.S. bee colonies in 2015. And without bees, many food crops won't get pollinated, which is necessary for their growth. See a partial list here. March Against Monsanto organizers say there are some things you can do year-round to fight the Monsanto Mafia. You can vote with your wallet by buying certified organic foods and nutritious organic superfood supplements. You can grow some of your own organic food. Some have suggested boycotting "Monsanto-owned" companies, but in reality, that's not practical since Monsanto's biggest threat is its control over food ingredients, especially corn and soybeans, nearly all of which that are grown in the U.S. are genetically modified. So eating organic is the best way to ensure you're denying Monsanto income while eating healthy. Finally, you can insist through your representatives that the U.S. government begin conducting more research on the long-term effects of GMO seeds and foods. And take place in every March Against Monsanto that you can. But what you should never do is expect the mainstream media to cover this very important effort. Same mainstream media that gives massive coverage to 'Fight for 15' protests staged a complete BLACKOUT of March Against Monsanto protests... ever wonder why? 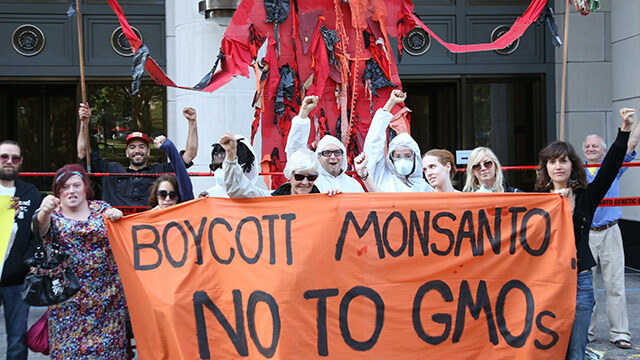 Join the global March Against Monsanto this Saturday!